So this week I finished off a beautiful dress, which I don't have any decent photos of so you can't have a blog post about that until I've got some nice photos. (The dress is made from a pattern - Simplicity 1375, view B if you're curious in a very bright fabric). However, I wasn't happy with its neckline. It was a nice cut, it just needed a little something extra. Enter the chemisette. 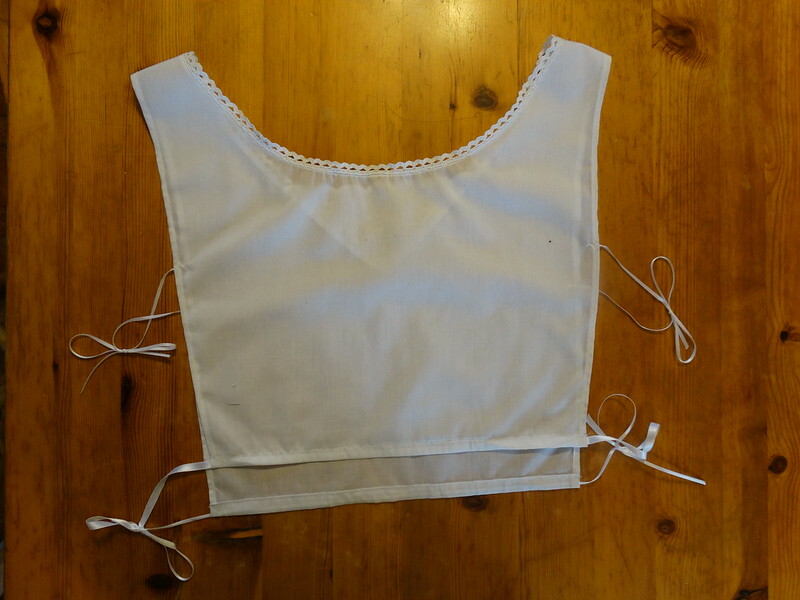 A chemisette is an undergarment that is worn to fill the front and neckline of any garment. They give the appearance of wearing and short or blouse under your garment, but they don't add any bulk to the waist or arms (yay!). I think they were most popular in the Victorian and Regency eras - and there are different styles from the different eras. From what I've researched online, mine seems most like a Victorian chemisette. It could add warmth and modesty so you could wear a dress as a day dress but without the chemisette you could have a low cut evening dress - thus extending the wearability of your dresses! 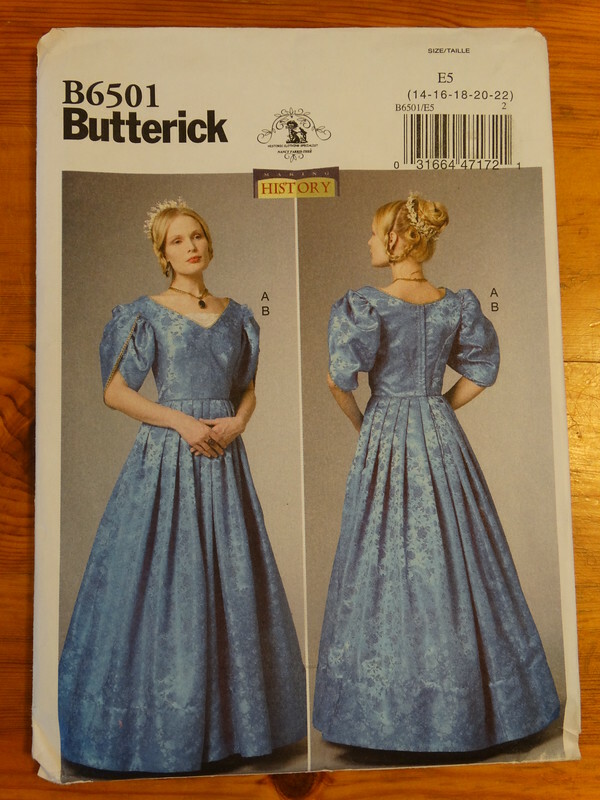 So I'm using the Chemisette pattern from Butterick B6501. This is mostly a dress pattern and I will be making this dress in the near future, but I was sorting out an issue with the newly finished dress mentioned above as I want to wear that dress tomorrow! The chemisette is made up of a front and a back (which don't meet under the arms). It is done up using ribbon ties under the arms and a ribbon drawstring at the bottom, near the waist. 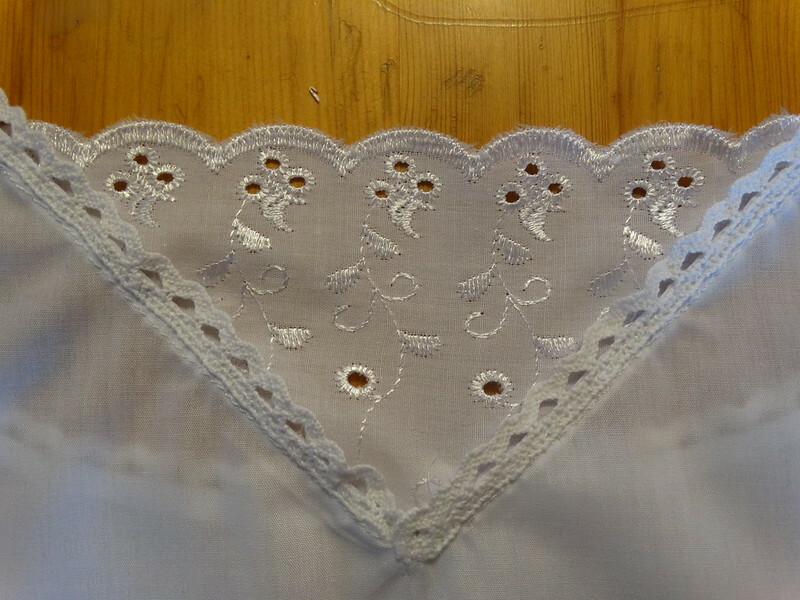 It has some lace trim around the neckline and a scallop lace section at the front. The trim and lace section is easily customisable. 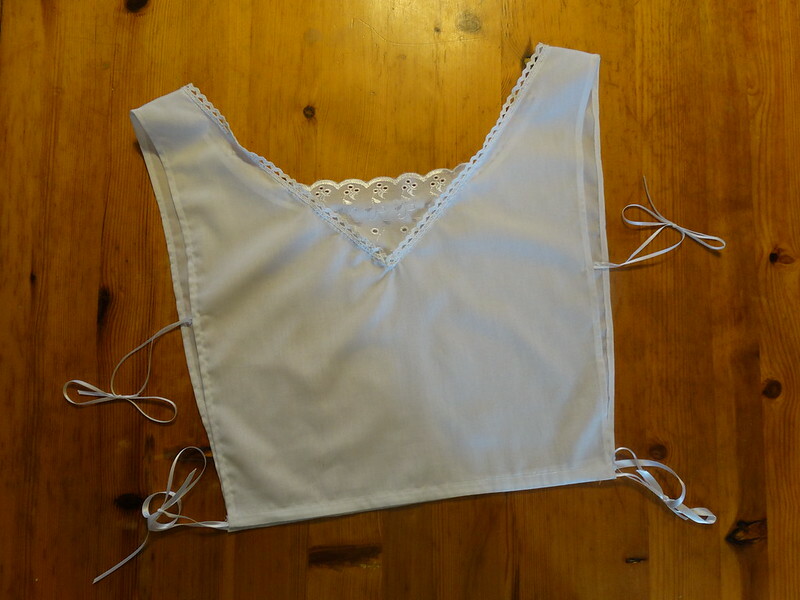 I cut this pattern out of plain white polycotton (puchased from Minerva Crafts) in a size 20. The trims and scallop lace were purchased from the same place and were sewn on entirely by hand. It has easy french seams at the shoulders and less easy narrows hems around the neckline and on the sides. 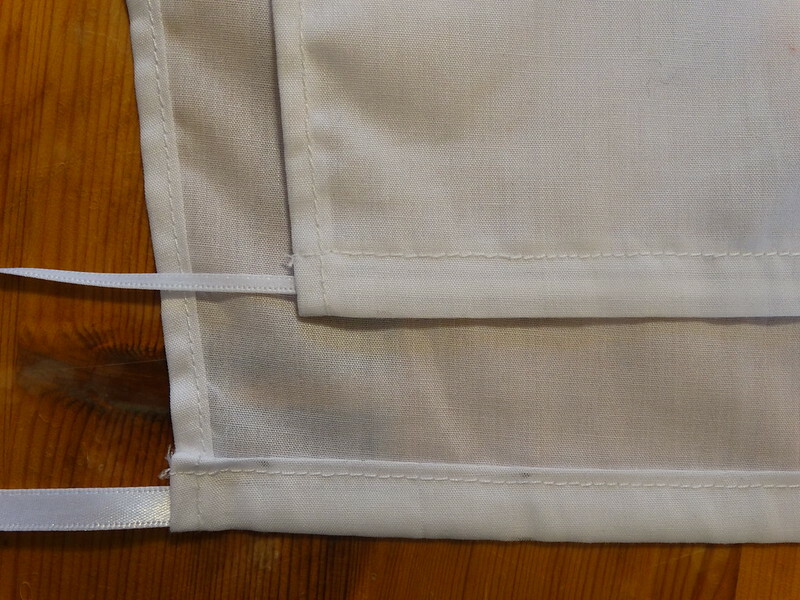 The bottom hem was larger and turned up to make a casing for the drawstring. The chemisette is really hard to put on by yourself. You put it over your head and then tie up the ribbons under the arms and then the sides of drawstring and make sure its sitting right before pulling your dress on over it. Tying those ties is just hard work on your own! However, the dress is also clearly going to be a two person job (anyone fancy doing up 11 hook and bars up the middle of back by yourself?) so its not the end of the world that chemisette requires two people either! If I was going to make another one, I'd probably pick a different pattern that is much easier to do up by myself, but its a nice garment and I can definitely wear it with a number of my dresses so thats a win! So that's been what I've been creating in the last 24 hours! Hope you enjoyed my blog post about chemisettes and I'll see you next time, hopefully to show off a beautiful dress!